This past Monday (Memorial Day), I competed in the second RTC Series for the 2012 season. 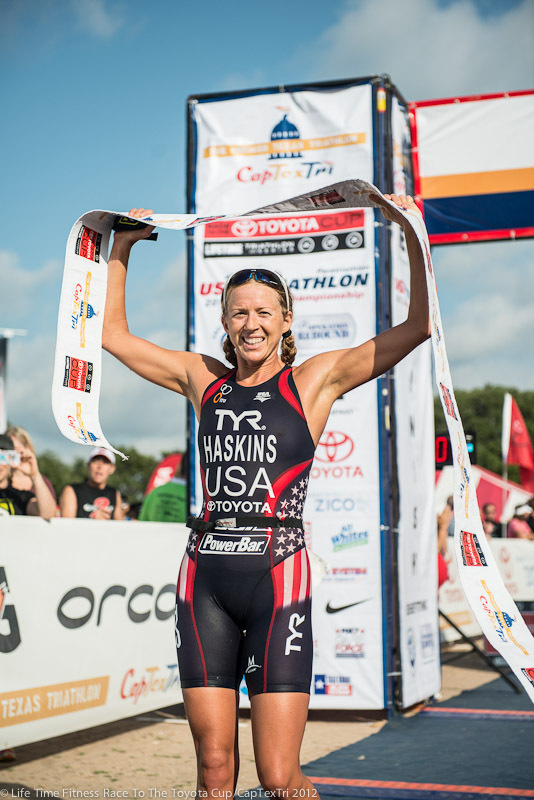 This was also my second time back to Austin and a chance for me to defend my 2011 race title. Last year I was quite impressed with the city of Austin. There are many great parks, running trails and not to mention great food. Great food is always a plus post race when your body is craving beef and ice cream! I was lucky enough to eat at Phil’s Ice House and get some of Amy’s Ice Cream. Wow best burger and ice cream I have had in along time. Saturday Night before, I had the honor of being invited to the Wounded Warrior Dinner. I had the opportunity to listen to many wounded service men and women who have gotten involved in athletics and are now representing USA on the race course. It was a very touching dinner hearing the stories of survival and true determination not only overseas but also back home. Hearing the stories of the warriors really puts things in perspective. It was an honor to race along side them on the course as CapTex was the Para-triathlon National Championships! The race began at 5:50 AM (5 min behind the men). 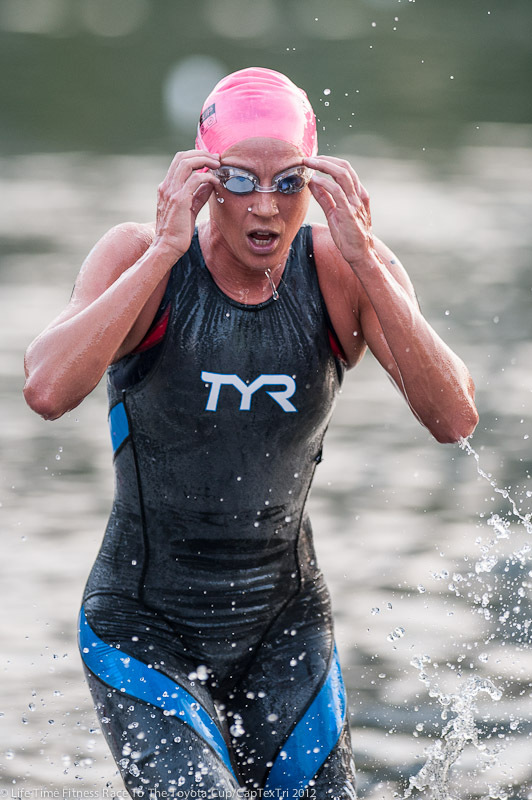 The swim was in Lady Bird Lake, It is great for spectators as they can stand on all the bridges and watch us swim the entire course beneath them. It was a deep water start with about 30 women at the start line. The water was quite warm at just over 81 degrees and very calm with little current. 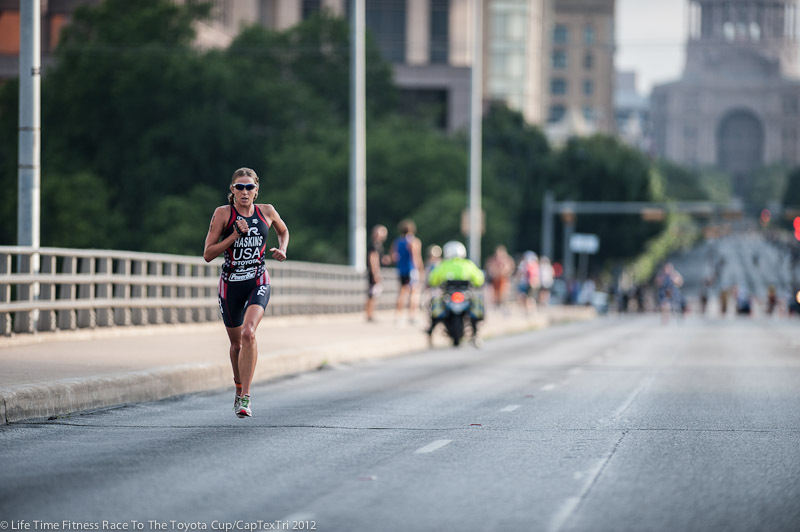 I lead the majority of the swim course (after the first 150meters) and kept a high tempo the remainder of the course. I did not want to get my core temp up too much heading out onto the bike course. 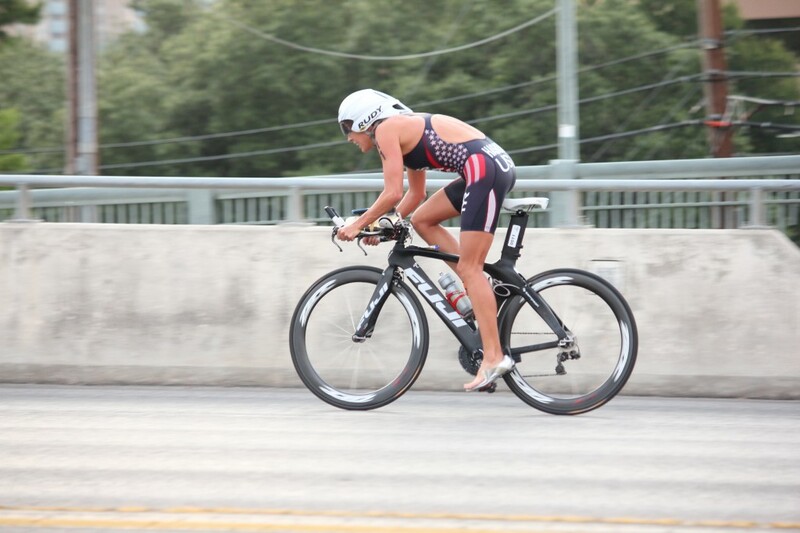 I exited the water with Annabelle Luxford right behind me and got on the bike as quickly as possible. 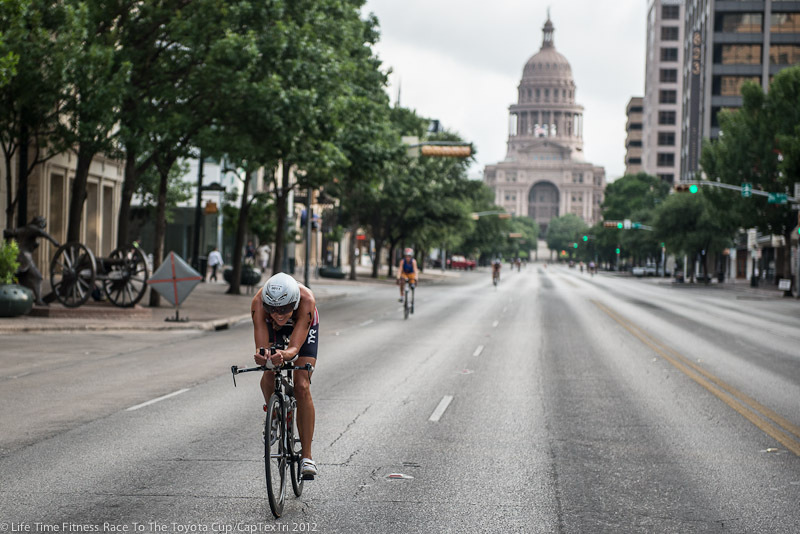 The bike course was 4 loops through downtown Austin, It is a hilly technical course with fast turns and wide roads. It is fun racing on streets that are usually filled with cars and red lights. The first half lap of the bike, Annabelle was with me and half way through the first lap I opened a gap up on her. I was able maintain a consistent lead throughout the remainder of the bike course (20-25 seconds) and was feeling fatigued at the half way point. 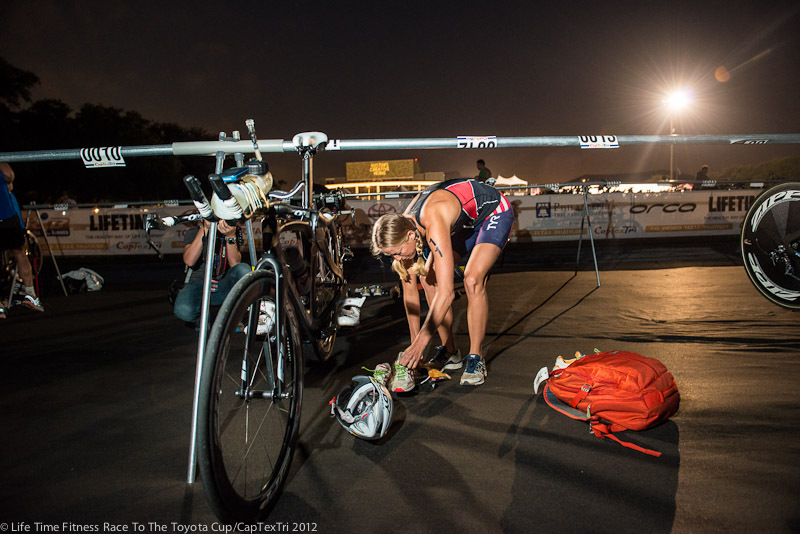 By the last lap, my legs were screaming at me and I was just hanging on. Sometimes when my legs feel terrible on the bike they feel okay running, so I was hoping on that theory. The run course was 2 laps and Once out on the run course, I did not feel amazing, but I felt much better than on the bike. at the start of the loop, you can see where your competitors are, so at the halfway point I opened up a 90 second lead over the other athletes. Yesterday was one of those days I was ready to see that finish line and the closer I got to the tape, the more sure I was of accomplishing my goal. I ended up crossing in 1st and now have back to back victories in the first two races of the series. I know it’s a long season ahead and I need to continue to be smart and listen to my body. Right now, I have a short break to help recharge myself for the rest of the season. Thank you to all my sponsors, friends and family who always have my support. Also, a special dedication to the men and women who have served past and present.